1. Gain deeper insight into a city: Local hosts can show a more edgy, more beautiful and more authentic version of a city. They can show you what’s happening ‘behind the scenes’; the hidden gems, local customs, rituals and etiquette. They can teach you basic conversation skills, give you transportation suggestions, safety tips, and more. Whether you want to explore the underground culture in Berlin, the local art scene of Paris or even the best dive bars in Prague, a local host’s intimate knowledge will introduce you to a more unique experience than you’d ever get from a pre-packaged tour. 2. Enjoy an out-of-the-box experience: Other platforms are perfect for curated tours, but Chumaround thrives on a more local, personal experience. You and your host have the freedom to decide what activities you want to do. You can take a turn down any twisty street, or browse any fancy shop that catches your eye, giving you the option to make on-the-spot decisions and enjoy whatever comes your way. 3. Connect with like-minded people: In just a few minutes you can search for local hosts in the cities you plan on visiting. You can find a host for a vacation destination, or search for a host in a city just around the corner from where you live. You’ll be able to read their descriptions and learn about their interests and hobbies. You’ll also be able to read the reviews and recommendations left by other users. This makes it easy for you to connect with people that share similar interests. In this way, you’ll find yourself meeting people local and abroad that enjoy doing the things you love to do. 4. Save time and money: Whether you enjoy shopping, nightlife, museums, or landmarks, navigating a new city or a place you’re unfamiliar with can be very time consuming and exhausting. Sometimes, you spend so much time being lost, you have little time to really enjoy the experience itself. That’s why having a local host is a great idea. Just think about how much time you’ll save trying to figure out where to find the best restaurants, parties, local goods and best prices. 5. Support locals you know and like: When you book a local host on Chumaround, you eliminate the expensive middle-man; the tour companies that charge high prices and pay a small amount back to the people that actually do the guiding. When that happens, you contribute directly to the people you’ve met and connected with; the student trying to earn tuition money; the mother saving a family vacation; the retiree searching for something to do in their free time. 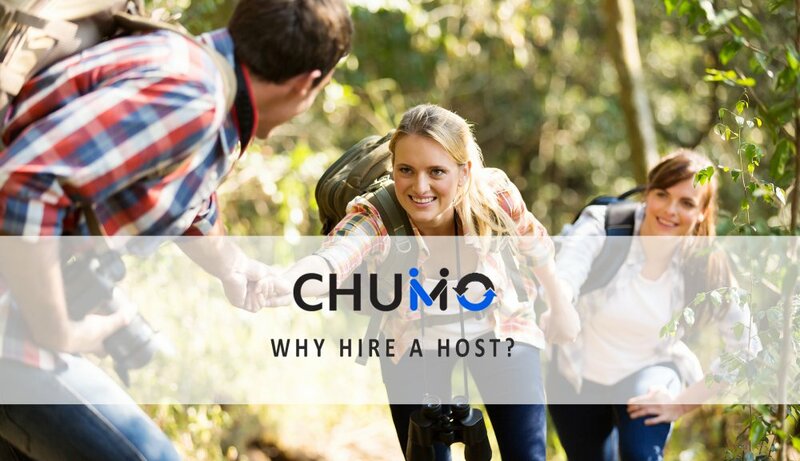 Every time you book a local host on Chumaround, you’ll have peace knowing the money you spent is helping to support the local people you’ve met. 6. Make international friends: If you’ve ever participated in touring a city via a curated tour with a pre-packaged itinerary, then you know the feeling of walking around in a large group of people listening (or maybe not) to your guide spout some historical facts and figures in a script they’ve memorized and perfected over hundreds of tours before you. And when you’re finished you may not remember anything they said. You might never have learned their name. On Chumaround, when you book a local host, you’re booking an unscripted experience with someone that shares similar interests. When you chum around with someone like you, you’ll find it much easier to meet people and make new friends everywhere you go.